Oil on panel, 78,5 x 62 cm. We do not know with certainty who the subject is, but it could be a wealthy merchant or banker from Bergamo. He captures the viewer with a persistent, slightly distant gaze. He holds a rosary in his hand and the position of his forefinger and thumb suggest that he has been counting. With thin brushes, Lorenzo Lotto has accentuated the jewellery, the thick and well-manicured nails, the vest’s bow and the thick silk of the sleeves, all painted with extraordinary virtuosity. As always in his portraits, Lotto has succeeded in presenting an individual with thoughts and emotions rather than a type or ideal. Lotto’s painting style departs significantly from the Venetian tradition as reflected in the work of Bellini, Giorgione and Titian. In his religious subjects, the colours are darker and his compositions are more tumultuous. 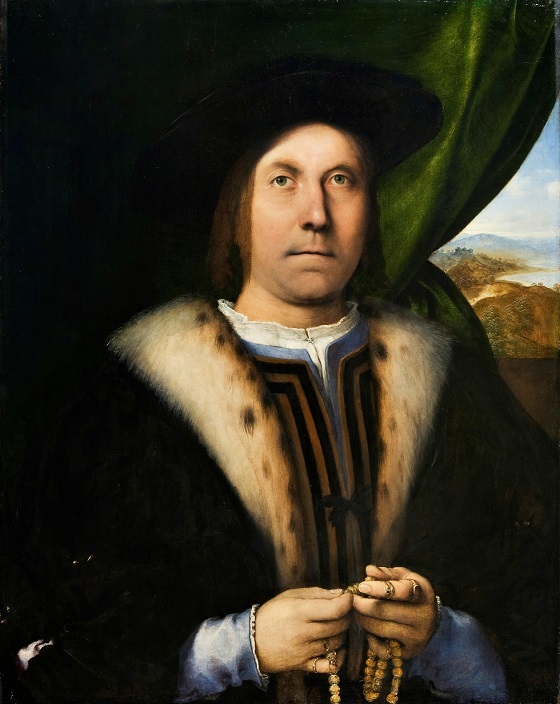 But it is particularly within the portrait genre that Lotto, with his unique capacity for psychological identification with his subjects, sets himself apart as one of the best Renaissance painters. His models have an unusual presence and are portrayed with a nearly mystical undertone that makes them captivating and interesting for the viewer.